Thomas Moran's paintings of the American West helped establish the National Park system. 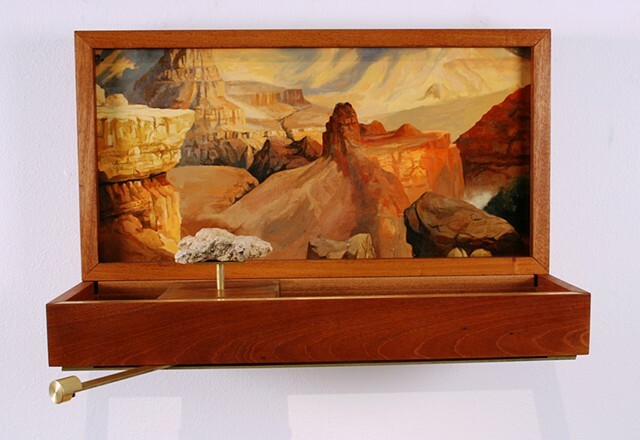 This painting, Grand Canyon (1871), is a perspective from the South Rim of the Grand Canyon from a location later to be named for him, Moran Point. The sandstone fragment is from Moran Point and is mounted on a carriage that allows it to slide between 111.924350 W and 111.924276 W - the GPS coordinates of a 36 foot stretch of that location.